Wallpaper can transform a room quickly and easily. Today, wallpaper is the hip new approach to cover your walls, a way to express your individuality. Its so versatile; you can wallpaper all four walls, one accent wall, the ceiling or create a large over scaled piece of artwork by framing it. With patterns that go from formal to fresh with over-scaled motifs, raise textures, and modern palettes there is an option for all tastes. 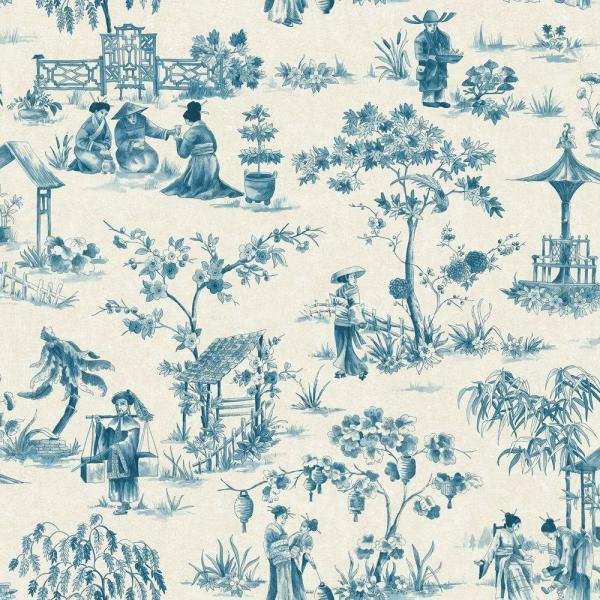 Beautiful china toile pattern in blue jewel tones. Contains Microban Antimicrobial Product Protection which inhibits bacterial odors and stains, mold and mildew. Durable, moisture resistant solid vinyl material is great for high traffic areas. Our Blue Mountain Promise. You'll love it or we'll replace it. Guaranteed!TM. See your retailer for details.